After last Thursday’s Tech Talk Post, I know that you have now pared down your electronic cables and labelled everything that’s not currently in use. Great work! Now, apply what you learned to the cords that are currently in your workspace. No more guessing about which cable connects to which device – grab some colored duct tape, those handy bread tags, or your labelmaker and end the confusion for good. While you’re at it, why not label the cords at both ends while they are all plugged in? 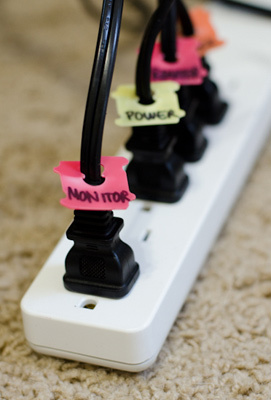 By doing this, you’ll know exactly which cables are plugged into that power strip. It’s also handy for connecting one device to another, for example: end 1 “External Drive” and end 2 “Computer.” This way, when you disconnect everything to organize the tangle of cables (stay tuned for next week’s TTT!) it will be a snap to put everything back together again.